This weekend I spent a few hours on Oxford Street checking out the latest batch of 'New In' SS14 pieces. It reminded me it has been a while since my last 'High Street Hits' post so here we are..! The great British high street has mangaed once again to create completely covetable yet affordable pieces to update your wardrobes for Spring/Summer 2014. I have selected some of the prettiest pieces with a colour palette ranging from primrose yellow and powder blue to rose and cornflower. I need to share these Primark polka-dot court shoes with you as they have featured in my office moodboard since their press day. They exemplify the SS14 season with a few key details. They are in a fun spotted print feature cut out details and also come in these sweet sorbet shades. They are entirely versatile and will compliment almost every trend this season. Keep your eye out for them as I have a feeling they will be in demand, especially with a £14 price tag! New Look's floral pencil skirt is also a head turner. I am always a fan of any garment that can be worn in a variety of ways and this skirt has this very quality. For a night out team with a plain white or rose bralette top and matching courts or for daytime glamour wear with a white tee and a statement pastel necklace. If you are able to shop within the next few days, Marks and Spencer's cotton knit comes with 20% off in their special sale which ends on Tuesday 25th March! Marks and Spencer's SS14 collection was one of my most favourite because they have a wide variety to suit all shapes. I do realise this doesn't apply to all stores, which is one of my bugbears. However they do make it easy to shop online if you have a small store near you. Let me know which piece you choose and if you snap a selfie send me the link on my twitter or instagram. 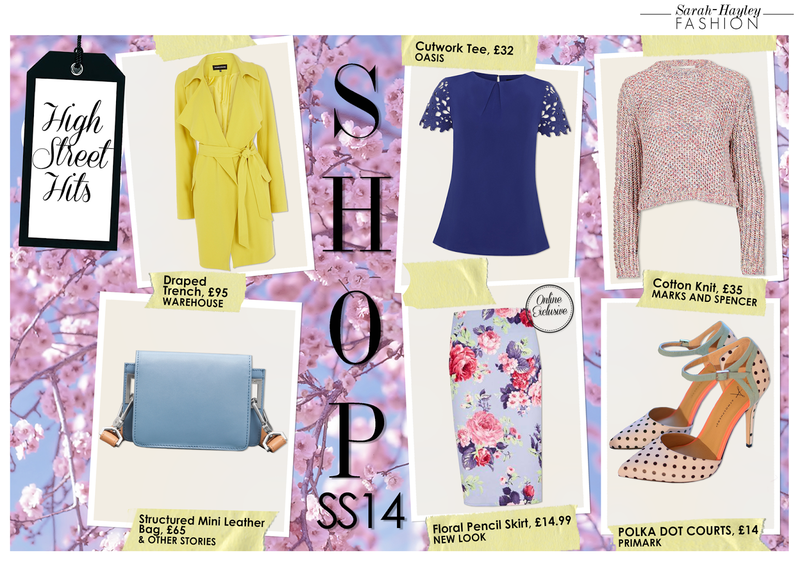 Happy Spring/Summer high street shopping!